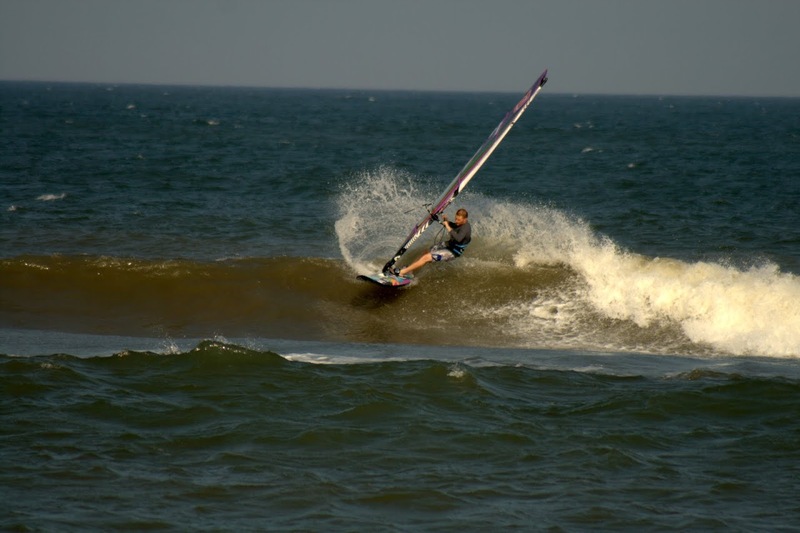 Bill's OBX Beach Life: Hatteras Summer Wavesailing Ground Hog Day! Hatteras Summer Wavesailing Ground Hog Day! What can we say, this is every day so far in July! The windsurfing season reserved usually for the locals, weekend warriors, and those who have the summers off (Ace, the New England school teacher, scored a killer trip while here for nearly 3 wks!!) has been as HOT as the outside temps with daily afternoon SSW hitting mid/upper 20 mph range daily. Surf has been up and down, but yesterday a nice E swell was hitting the islands! The good news, this SW is not going to end anytime soon!! Come on down to Hatteras and join the FUN! Just in, here is a sweet little vid Andy McKinney at Wind-NC put together highlighting the sesh last Friday! FUN time! How was nags head yesterday? 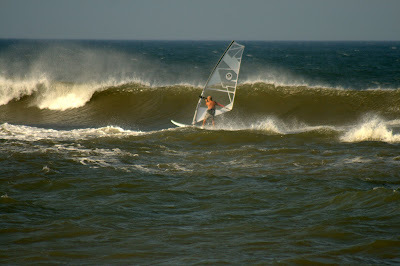 Nags Head was fun for simple refreshing "ocean sailing." I missed the prime surf window as when the tide came in (mid afternoon), the surf became weak, though a few nice sets did roll though. Wind picked up too much for the SeaLion so I had a rare standard windsurfing sesh at Jennette's. I actually sailed "upwind" from the north to south side of the Pier where I found an outer bar that was working, but it would have been awesome if the tide was lower. Spent time navigating amongst fishing vessels on the way in/out of the surf zone as the captains had the boats in close to shore, I guess due to the strong side-off wind and calmer waters near shore. All in all it was a fun high wind session, though with the inside wind shadow and high tide, I could not really do much on the standard kit inside. Though, I did find a few rare hits, a few outside loops for the boat captains/crew, and a relaxing ocean rest about 3 mi offshore where I simply dropped the rig and laid in the water for a little while enjoying the moment. Yeah. I call that a score anyway. More Ramp 30 Action Friday! Summer Action Firing at Rmp 30!! Red Bull Storm Chase Coming to Hatteras!?! AWT Hatteras Wave Jam 2012 Poster! Your Missing Out on Some Real FUN! Day Three, Saturday Wavesailing Action! Beautiful Side Off at Billy Mitchell (Ramp 49)!